An extensive ridge from E/N Europe is spreading into central Europe as a large upper low, which was dominating SW Europe previous days, diminishes. Another cold core low pushes across NE Algeria. 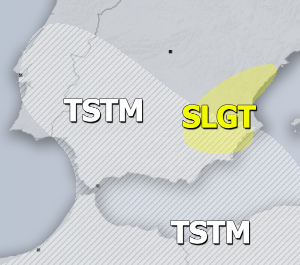 A SLGT risk has been issued NE Algeria into N Tunisia with threat for severe storms capable of producing severe winds, large hail and torrential rainfall. Marginal to moderate instability overlapped with strong shear/helicity will be supportive of organized storms along and ahead of the cold front pushed from the SW. Storms should spread NE-wards towards Tyrrhenian sea in the evening hours. A MRGL risk has been issued for SE Poland, W Ukraine into NE Romania and N Moldova with isolated threat for severe storms, capable of producing some marginally large hail and severe winds near a decaying difuse surface front.